Today, we’re excited the announce a new feature custom built by cStreet Campaigns for increasing constituent engagement on NationBuilder: Personal Feeds. Personal Feeds are the perfect complement to Public Profiles and allow organizations and campaigns the ability to provide a curated content experience to users. If Public Profiles are NationBuilder’s equivalent to a Facebook profile, a Personal Feed is your users Newsfeed. Personal Feeds aggregate your followers, those following you, your point person, an activity feed, along with the most exciting part - events and blogs curated based on a custom variable. 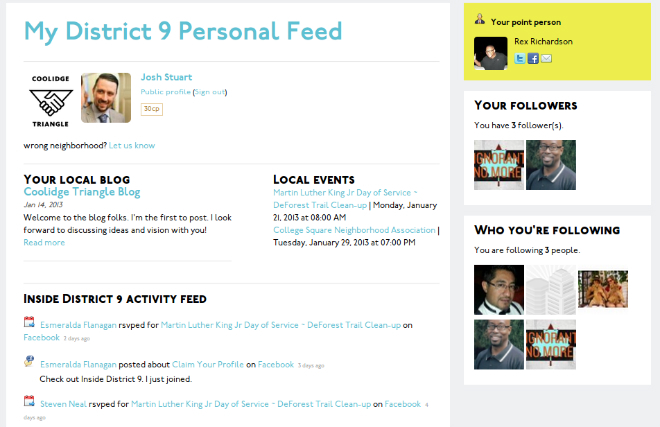 In the case of the recently launched Inside District 9 (the first implementation of Personal Feeds & pictured here), we used supporters neighbourhoods as the differentiator, allowing us to provide a resident of the “Coolidge Triange Neighbourhood” with a list of the most recent blog posts by their neighbours and an upcoming events listing specific to their neighbourhood. Further, we coupled supporter profile pictures with a badge representing thier neighbourhood that follows them throughout the site to remind them that they're recieving a neighbourhood specific experience. A union for instance could provide their members events & blog posts (or other content like press releases or petitions) curated based on the union local they belong to or their employer or workplace. An electoral campaign might choose to provide different content based on an issue area (women, youth, environment etc) most closely associated to the voter. Non-profit groups could provide donors with a curated experience based on the program areas they've donated to. We’re looking forward to rolling out Personal Feed Pages to more and more Nations in 2013. If you're interested in adding Personal Feed Pages to your Nation, get in touch.